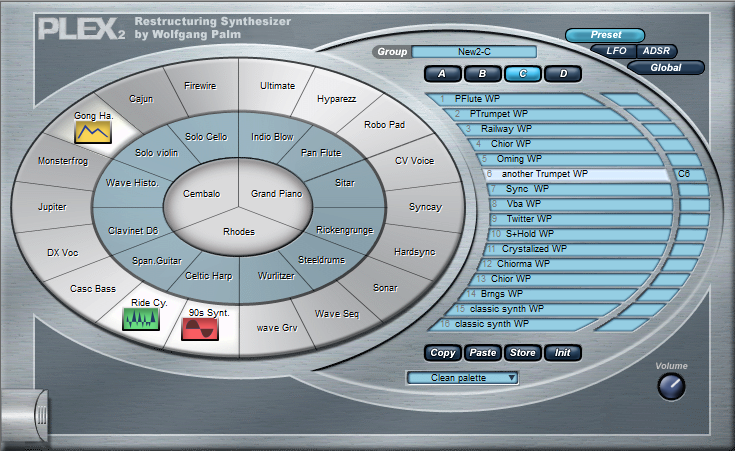 Plex - Restructuring Synthesizer by Wolfgang Palm is a Virtual Instrument Audio Plugin. It functions as a VST Plugin. Plex is a "Restructuring Synthesizer". The original sound is split into four components, lower spectrum, higher spectrum, filter characteristics and amplitude envelope, using a new audio analysis technique. Each component can be replaced and combined with other elements. The result is a thrillingly "natural" sound. New synthesis approach by "PPG legend" Wolfgang Palm. Real-time swapping between components of 33 sound sources. 97 special pre-analyzed sound sources included. 3 ADSRs, 3 synchronizable LFOs, global pitch LFO. Modulation section with Stereo Delay and Flanger effects. Up to 64 voices, 300 presets included. All parameters accessible via MIDI controller. NOTE: Plex 1 was distributed by Steinberg as a commercial product. 3. I missed a semitone-controller, you can only choose the octave. Furthermore the phasersound is very onesided. well plex was an odd failure in marketing terms... which is really strange cause this unique synth definitely produces beautiful - and very expensive sounding - digital pads and "moving" sounds. personally i find the soundscapes this synth is capable to do very close to the sound of my wavestation sr. sure it doesn´t feature wavesequencing ... but it sounds airy, impressive and soundtrackish to the max imho. the userinterface indeed looks like a electronic game from an bygone age :) but is amongst the most accessible interfaces for a synth i ever saw. it´s so easy to come up with useful musical sounds... sure it doesn´t produce one-note wonders, but used in a arrangment the sounds become "alive"...glittering and sparkling with beauty and class. if you are looking for realistic analog sounds or imitations of natural sounds you won´t get happy here, but if you like those etheral pads and synth sounds this is the right thing to get. and since it was included with newer vstis from steinberg for free it´s an absolute steal to have!!! if i had to describe the soundcharacter i would say: airy, digital, crisp, floating above the ground... (ok, i am biased, i love this thing). There seems to be a backlash against so-called 'large' companies and their products. N.I. experiences this problem as does Steinberg. In Steinberg's case some of their entries in the VSTi world have deserved negative attention. Plex is different though. It is a 90's rompler workstation with the brain of a mad scientist. At times Plex sounds like the Wavestation's cousin. Plex works with a bit more than 90 processed samples that work as data for various color coded segments of the instrument's character. Yellow = filter, Red = base sample and Green = Top component. 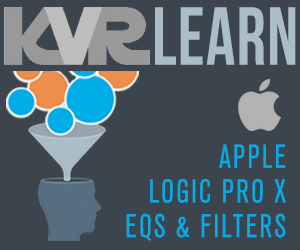 The forth component is the simple but effective LFO and ADSR envelope areas. Designed by Wolfgang Palm this instrument cleverly combines simplistic control while associating timbre and sound functions with colors on a interface that at first look seems daunting but is very simple. Read the manual, it is well written. 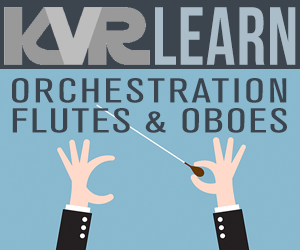 The principle of Plex's synthesis engine boils down to this; you have restructured waves as your virtual instrument's basic tonal character, it's color (or overtones) and it's physical characteristics. Restructured waves are based on traditional instruments, synths and a few novel but interesting artificial objects and for lack of a better way of saying it, realities. The LFO is simple yet powerful and depending on how you construct your instrument can be anything from a simple lead to something wildly exotic. Plex is digital sounding due to some seemingly uninteresting samples, but looks decieve. If you're buying Plex as your virtual rompler keep looking. Plex is more than the sum of it's samples. They are constructs that come to iife when the patch is designed. Great sounds can be made with Plex. It's samples are designed for synthesizing, not realism. Think of wavetable synths, would you judge the microWave based on the sound of it's wavetables? Similarly, why judge Plex by bland samples. It's not a sample playback synth! i think plex is underrated. It got some bad reviews, and it seems nobody talks about it anymore. and that's wrong. Ppex can produce some very cool and unique sounds, the samples it's based on may not sound very good on their own, but combining them and playing with the lfos (extremely flexible lfo's btw) and adsr and stuff is the real strength of plex. the sound definately sound digital, not analog at all, but alive, breathing, and NOT cheap. this synth (you should treat it as a synth, not as a sampleplayer)is one of the few really unique synths out there that are godd and USABLE as well. and of course the interface simply rocks, one of the best interfaces i've seen so far. and it's easy to use, and the manual is ok as well. This is a modern sample based VSTi which is a good thing as this thing allows me to quickly dial up certain standard sounds plus some more. This is already the real strength of this synth -SIMPLICITY- as it has the right blend of not too many parameters but enough to make some changes to the sounds, easy and predictable. I've got enough super versatile synths for the mega tweaking so this simplicity here is a real strength. User interface: not good looking to me and the controls don't feel cool when moving so while there aren't too many of them and I don't tweak this thing very much I can tolerate that. Sound quality: Some sounds are really great. some samples could be better but generally it works for what I want from it. Features: The one feature I really miss is the ability to use own samples. I'm not sure if that would really do but in some situations it's highly desirable. Documentation: The manual is OK.
Presets: Some really good ones, a lot OK ones, with own programming much more cool stuff is possible. Customer support: These guys really want to help and do know a lot. Value for money: Definitely yes! yes, look in the documents file and select your language. 52 pages in pdf format. Full documentation in german, english... and french! Great. Wolfgang Palm was the owner of PPG and its chief designer. As far as I remember he made his first synthesizer in 1975 with the help of... Tangerine Dream! He is the creator of the digital wavetable oscillators that were used for the first time in the famous PPG Wave 2. When PPG ceased to exist (in 1987 if my memory doesn't fail) he continued his work with Waldorf, which is now reknowned for their fabulous synthesizers developed around his digital wavetable synthesis and used by many of the most famous musicians all around the world. This is a very fun little synth. Just drag and drop the 3 waveforms into the various sounds and the parameters seem endless! Right click the mouse in a section for a drop down menu to add sounds to each section. Many presets to choose for starting points, too. This thing has kept me up late quite a few nights. Haven't even got to thinking about a manual yet. Very nice for a freebie.